So, if you’re tired of the same old mix, why not try one of these incredible tomato cocktails? 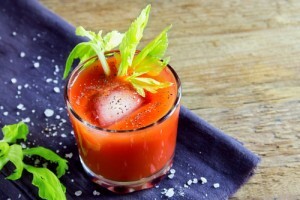 Tomato juice is a common mixer for cocktails, but why not get creative with tomatoes themselves? 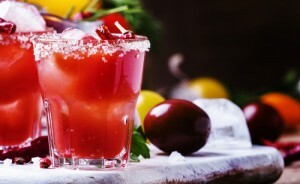 Tomatoes are such a fun ingredient with both a vegetal and sweet flavour, and mescal is very similar. Heirloom tomatoes, and yellow and orange cherry tomatoes, are also fantastic options for cocktails. Muddle the 5 grape tomatoes in the shaker until well crushed. Combine the rest of the ingredients in the shaker, add ice, and shake vigorously until well mixed. 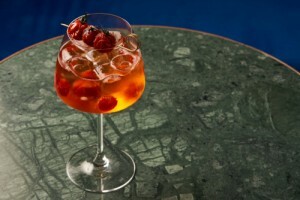 Double strain with a Hawthorne strainer and fine strainer into a coupe, and garnish with the charred lemon. This drink is a crazy blend of fresh heirloom tomato juice, grapefruit juice, lime juice, orange juice, tobacco, beer and bourbon. But trust us, it’s good! It’s a powerful concoction that shows a tomato’s more robust side, furthering the argument that tomatoes can be cocktail stars. Muddle the cherry tomatoes in a cocktail tin. Add all of the other ingredients and ice. Shake until chilled and double strain into a glass over fresh ice. Garnish with a cherry tomato and a sprig of coriander. This classic Mexican mix is an exciting way to liven up a lager on a hot day. Think of it as a mix between a mimosa and a Bloody Mary and you’re pretty much there. Wet the rim of the glass with a wedge of lime and dip it in the salt. 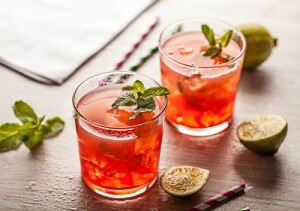 Save another wedge of lime as garnish and squeeze the juice from the rest of the fruit into the glass. Drop in the ice cubes, pour the tomato juice and sauces over them, and fill the glass with beer (use any that’s leftover to top-up the drink as you go). Stir gently and pop the wedge of lime on the rim. Okay, this one is pretty close to a Bloody Mary, but it has some interesting elements, including “ice cube lettuce” and delicious bacon. And who doesn’t love bacon? Run lettuce through a juicer, or puree in a food processor add the juice of one lemon and 1 tbs of salt and then strain. Pour the juice into ice cube tray and freeze until hard. Moisten the edge of a Rocks Glass, and roll the edge in pulverized bacon dust to coat the rim of the glass. Add ice cube, vodka and tomato juice and stir gently. 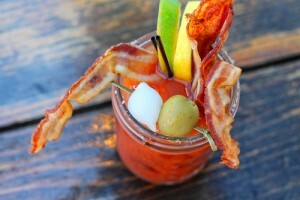 Garnish with crispy bacon! Soft, juicy tomatoes work best here, as they’re likely to expel more water. 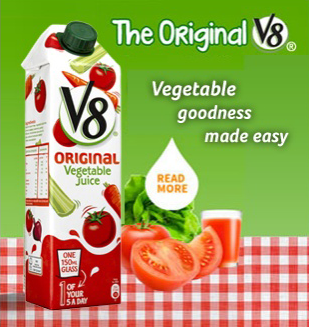 Tomatoes’ lycopene content catapults them to the next nutritional level. Studies show lycopene has anti-inflammatory properties—which is why this ephemeral fruit may help decrease your risk of heart disease and cancer. St-Germain adds warm floral notes while fresh lemon rounds out a light, citrusy flavor profile. And with its easy-drinking nature, you’ll find us sipping on this refreshing cocktail late into summer, morning, noon, and night. 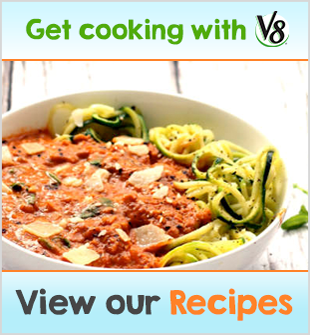 Place tomatoes and ½ cup water in a blender; blend on high until smooth, about 1 to 2 minutes. Pour through a fine sieve into a pitcher; discard solids. Mix in lemon juice, simple syrup, and salt. Add 1/3 cup tomato mixture, 3 oz. vodka, and .5 oz. St-Germain to a cocktail shaker. Fill with ice; cover, and shake well. Strain evenly into 2 glasses. Repeat twice with remaining ingredients. Garnish with tomatoes and fresh basil, if desired. A Mexican heatwave in every way! 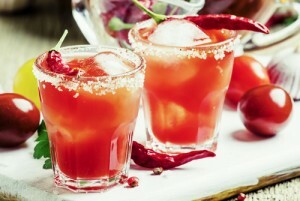 This fiery, sweet tomato cocktail combines the hottest mix of ingredients over ice for a dynamite taste experience. Not for the faint hearted! 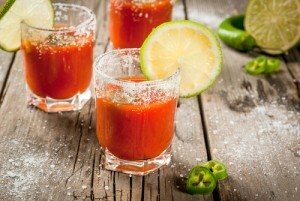 In a large glass, combine tomato juice, tequila, and lime juice. Add ice and several dashes hot-pepper sauce, and garnish with coriander. Essentially, it’s a Bloody Mary, only with gin instead of vodka. 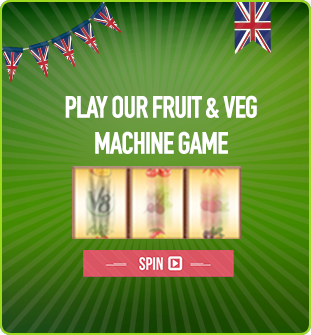 Easy to make, easy to drink and includes gin… what’s not to love? Shake all other ingredients over ice and strain into ice-filled glass. Martinis, anyone? 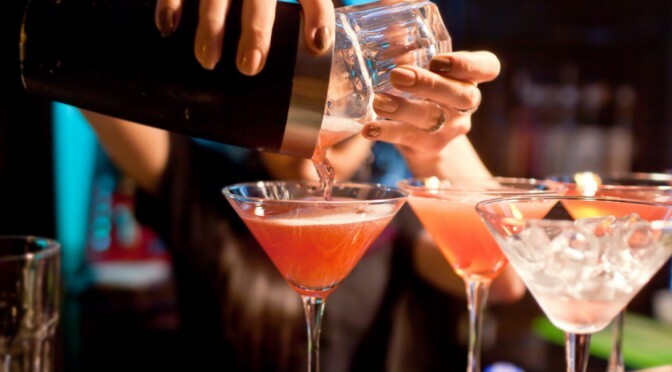 Spice up your summer gatherings with a sweet martini that has a bit of a kick to it! 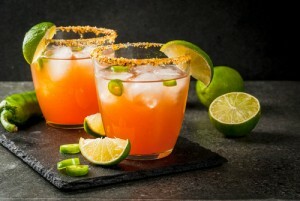 But unlike the classic harsh, bitterness, this cocktail uses spice to round out the flavour profile, creating a unique and delicious cocktail. Chop tomatoes, garlic, and jalapeño roughly. Place in a bowl with 3 tablespoons kosher salt and let marinate for at least 30 minutes, then transfer tomatoes and juice from bowl into food processor and pulse a few times until roughly chopped. Line a mesh sieve with a cloth napkin and pour tomato mixture into it. Let drip into a container overnight. Discard solids, and reserve liquid. For each martini, shake 80ml tomato consommé with 80ml vodka and serve strait up in a cocktail glass. Garnish with cherry tomatoes.